Today there is hazy sunshine and unusually good weather for Easter Monday. I am only planning a half-day of walking, in anticipation of a long drive home. But I’m determined to reach Swansea. Port Talbot beach is called Aberavon Sands. At its northern end, the beach merges into yet another dune system – Baglan Burrows, before being interrupted by the River Neath. Across the bay I can see Swansea. I walk along the beach and notice some black patches in the sand. When I get nearer, the dark streaks seem to be caused by fine black crystals of.. of coal? I wonder if this has something to do with the Port Talbot steelworks? Turning around, I squint into the bright morning light. The industrial structures are just visible through the haze at the far end of the long beach. My footprints leave a most satisfying trail across the sands. Before I reach the mouth of the river, the Wales Coast Path cuts inland through the dune system. Someone has kindly left a red cone to mark the way. I might not have spotted the wooden sign post amongst the sand. Over the dunes – and I see there is more industry ahead. The path follows the line of the fencing. I duck under a large pipe. Stencilled white letters on the side tell me the pipe is carrying ‘LIVE WATER’. Odd. How can water be live? Do they mean radioactive? But there is no nuclear plant in the area, as far as I know. A little further on, and the path reaches the river bank. Ahead I can see two bridges spanning the water. The first is the M4 motorway bridge. The furthest one carries the A48 over the river, and this is the one I will be walking across. Unlike the road bridges over the River Severn, which I loved, these bridges look most inelegant in comparison. But before I reach them, I come across a strange brick tower. At first I think it’s a water tower, but then I notice the plaque. How interesting! 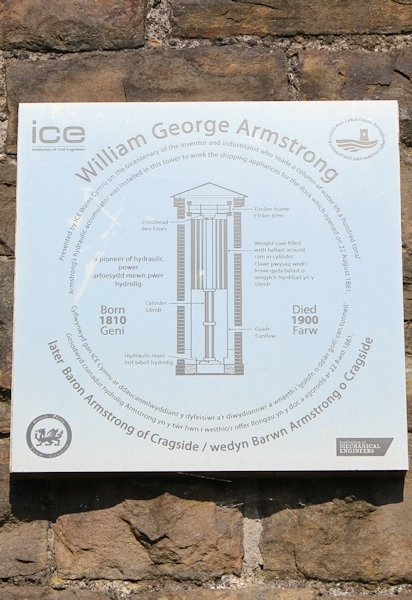 William George Armstrong was an industrialist who invented a hydraulic machine capable of lifting 100 tons. This machine, housed in the tower, worked some of the equipment in the days when this was a working dock. Now the area is rather nondescript, a mix of wasteland and parkland. Hard to imagine it as a busy port. Onwards – and I walk under the M4. How many times have I been under this particular motorway on my walk? Here it is again. An old friend. But the next bridge is the one I want. The road rises up to meet it. This is the A48 and has a pedestrian footpath running alongside the roadway. From the bridge I see this odd little marina. It seems rather sad, tucked away almost under the motorway, with all the noisy traffic rushing overhead. The Wales Coast Path (now nowhere near the coast) finally turns away from the busy road. I head down a quieter B road, and finally find what I have been waiting for. This is the Tennant Canal. It’s no longer navigable by shipping, but the coast path runs along the tow path. It’s a pretty walk and a relief to get away from the traffic. The canal runs along the edge of a large national nature reserve – Crymlyn Bog. In the distance I can hear the hum of the roadway – its only a few hundred yards away, but invisible. If I put my hands over my ears, I can imagine I’m in the middle of the countryside. Shortly before the canal comes to a dead-end, the path veers off and runs among a band of trees. I wonder if this is an old railway line? My map shows lines and sidings nearby. I don’t see or hear any trains. Beyond the trees is a flat marshy area. I have been meeting other walkers, including a man with a very wet, and very smelly, Golden Retriever. The dog has clearly been plunging around in the stagnant water of the marsh. Next comes a short stretch of residential road walking. The man who owns this garage (photo below) has plastered it with official looking signs and – despite the good humour of the display – it’s clear he doesn’t want anyone parking outside his property! I reach a large Park & Ride, where I was planning to meet my husband, but he txts me to say it is shut. Strange. I see a number of other disappointed motorists doing U turns as they discover the facility is closed. But, in a way, I am pleased. It means I have to carry on until I reach the next obvious meeting place – Swansea Marina. … and meet my husband, who takes my photo on the bridge. Then it’s time for the long journey home. Walker, writer, photographer, blogger, Doctor, woman, etc. 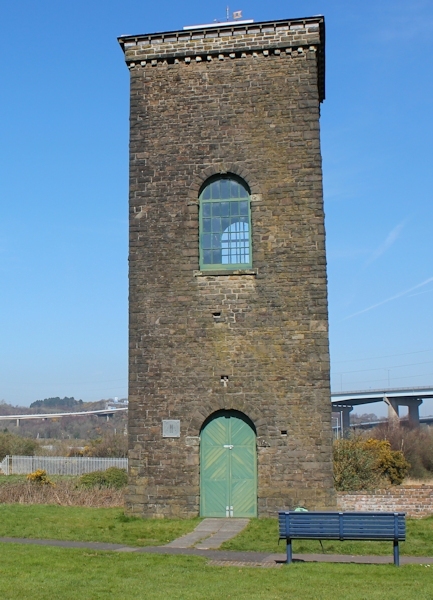 This entry was posted in 12 South Wales and tagged coast, hiking, photography, travel, walking. Bookmark the permalink. That A48 bridge was so noisy! When (on his sixth attempt) I finally heard my phone ringing, I couldn’t hear a word that my husband (Mick) was saying to me (he was trying to tell me where he was waiting for me for elevenses). I eventually gave up and had to ring him back once I’d got back to ground level. Definitely not one of my favourite miles of the Welsh coast! The canal section was lovely, but the rest… well, best forgotten. Its not good this stretch is it? The canal section was closed because of works on the electric cables overhead. Unfortunately they even had a security guard so I couldnt ignore the closure and carry on anyway. So I had to walk on the A48 the whole way. Horrible. It’s amazing how much coastal walking is inland & along busy roads! I’ve just finished North Somerset & was amazed how often I was close to the M5…even when I didn’t get lost! I was hoping Wales would all be ‘coast’, but obviously not to be…. Still, I’m guessing you’ve got some beautiful walking ahead of you in Pembrokeshire….enjoy! On a more positive note, I believe the authorities are working to create a coastal path across some of the private land connecting Kewstoke and Clevedon- and that will be a big improvement. It certainly would be a big improvement. North Somerset have some way to go I think, but I think they’re trying! The canal looks like just my kind of thing, what a pity more of the walk wasn’t like that. Lovely weather at least, and glad to see the bridges are back 🙂 The ‘weirdly shaped suspension bridge’ is actually a cable-stayed bridge – they work very differently to suspension bridges, even though both are cable-supported structures, so that’s probably why it looks weird to you. The forces on the deck are transferred up the cables to the tower and then down through the tower to the ground. On a suspension bridge the forces go up through the hangers, into the main cables, over the saddle on top of the towers, and back to the ground via the anchor blocks at each end of the bridge.